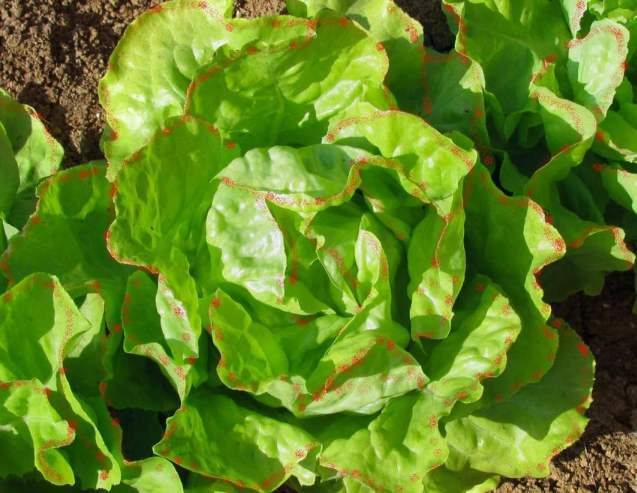 Lettuce is a very versatile plant. It can be planted in the spring or fall. I have seeds from the last fall's harvest, 75 or so. They will hopefully be a good cross between the types I had in the back. One of them tasted better but the bugs thought so too. I hope to get at least one not so bad tasting plant that the bugs don't care for. If I can get that then I'll really have something to save seeds from. Both of them were leafy and taste good when young, a few nibbles of some of the smaller leaves is always a treat. This year I'm going to put a couple on the side after I clear out the remnants of the sunflowers. They didn't do as well this year but I still got quite a few seeds to put up. In my heas the seeds may produce something along the lines of the following mind you this is an altered photo of normal lettuce. For those of you who don't know how to take care of lettuce here is a quick guide to growing it. It takes full sun and likes long days. It doesn't take heat well though and will bolt when the ground temperature gets into the 80's. It can take a light freeze overnight. A well ammended soil will do fine and no further fertilizing is needed. Water it when it gets dry. If it gets too wet, bugs will start to congregate. It can be planted in early to mid fall and early to mid spring. They also make good office plants if you have a corner office with windows to the South and East so the plant can get enough light. The temperature is usually good as well as the lack of bugs. This doesn't make the horror any less upsetting. I was mowing the lawn and decided to clip one of the cantaloupe plants to try and shock it into making melons. What I didn't realize is that there was a softball size melon hiding under the leaves. A thud and out rolled the clipped and cracked melon. I still have others starting so I'm not devastated. It's amazing how easy melons are to grow and how easy it is not to notice the fruit. It never ceases to amaze me how long a seed can sit in the dirt and still sprout. Recently I had a bird of paradise sprout. It didn't last two weeks but it still sprang up and said "hi" for a second. This morning I had another visitor in a seed starting tray come up. I think it's a bean plant but I'll have to check the charts when I get home. There are a lot of seets that lay dormant for years before sprouting. Typically seeds last a year or two. You can usually count on most of your seeds sprouting if kept for the usual time for the type of seed. Every year past that you can drop the number by half or more unless you have stored them well. The better you prepare the seeds for storage the better chance you have that they will sprout. Some seeds seem to sprout on their own. I collected a bag of acorns one year and they sprouted in the bag. I watched it for a week and by the end well over half of the acorns were sending out roots. My wife planted some coneflower seeds last fall hoping they would come up. Winter came and she forgot she planted them. We nearly removed all of the flowers since we thought we had contracted a bad case of some strange weed! Fortunately we hadn't gotten around to removing them by the time we realized what they were. Citrus seeds store well since they have a hard outer coating. They can be stored for years and still sprout. Of course after a long period you will want to score the outside or maybe even entirely remove the outer layer so it has a better chance of sprouting quickly. The second cantaloupe is growing nicely. The webbing is getting more pronounced but the underside is still green. It has gotten a little bigger so I really don't mind the wait. Just a little longer for sweet juicy cantaloupe! One of the vines in the back has a few little starters on it. The vine is a little bigger than the other one but it's been growing in the back. The shade hasn't let it get too hot and the soil is better so maybe I'll get some nicer melons back there. The tomato plant, the only on left, seems to be doing fine. I'm going to have to build a mound around it soon so it can grow fast enough to make tomatoes before the frost comes. I might even get around to making a cold box for it. No, it's not butterflies on parade. Rather it's things that attract butterflies. Several years ago we helped out with the Butterflies in the Garden exhibit at the Fort Worth Botanic Gardens. The butterflies really lilked the shirts they had for us. They were mostly yellow with a little black writing on them. It was just after we had taken a photography class from UTA and had some slide film left. We don't get to look at those very often. We went back out to the botanic gardens recently and took a few pictures. The butterflies were out in full force. This one didn't seem to be doing very well since he had a deformed wing. He was flopping or fluttering, depending on how you see it, in among the salvia. I wouldn't have seen him except that I was sitting on the ground next to the bush. He had plenty of flowers within reach and may still have lived however long he was supposed to for reproducing. This on however had fully formed and colorful wings. He was in mid-flap so it isn't as vibrant as it could be but it was one of the better pictures. After you grow your beans, tomatoes, cucumbers, carrots and any thing else you usually see in a typical garden you might want to grow melons. It's nice to get some good seeds and plant them, knowing that what you bought is what's coming up. After you harvest your first melons though there's no point to throwing all those seeds away! You may have spent three or four dollars on a pack of 20 seeds and there on the cutting board there's probably hundreds of them. You know the taste of the melon. You know it will grow in your area. You also know your family loves them. What you don't know is how to make sure the seeds will be stored properly. Fortunately you came here. You of course have your melon. So, cut it open and get the seeds. Now you have a mass of pulp and seeds. There may be seeds still stuck to the strands than used to run down the middle of the melon. If so, just pick up the strands and let them hang. Run your hand down the length, stripping off the seeds as you go. What you are left with now is a bit of wet seeds and a little pulp. At this point I use a strainer and put all of the seeds in it. Run water over the seeds and swish it around. The strainer will help scrub off most of the rest of the pulp leaving you wet seeds with just a little bits of stubborn pulp clinging on. As you dry them the little bits of pulp will be removed. What I like to do is use paper towels for this. The seeds will stick a little at times but the pulp really likes to hang on. As pulp dries it gets sticky. As seeds dry they slip. Now you have dry seeds. Well, mostly dry. You don't want to stop just yet. If you run your fingers through them they will feel cold. This is due to the moisture still in them that will rot them if not removed. I've stored too many seeds when I "thought" they were dry to make that mistake again. Pick through them again looking for any hidden pulp and remove it usually just a film. After the film is gone and you think they are dry enough to store you might let them sit out for a day on a paper plate to fully dry. They will feel a little cool still but not cold to the touch. I use plastic bags or canisters but if yo want to use paper for storage it breathes a little better and will help pull out moisture just in case some is left. Check the bags for problems for a few days. If a problem starts you can usually save most of the seeds and remove the problem. Next season you can plant. We have some 4 O'Clocks flowering in the morning instead of at 4. This really shouldn't be a cause for concern but it would be really cool if I could get some flowers blooming like, and this isn't a pun.. ok it is, clockwork. I know it's probably been done by plenty of people but I've never heard of or seen it done where a clock is made up of flowers that bloom in succession at the different hours. A real vegative biological clock. Ok maybe it would be a bocanical clock, whatever. I remember my grandfather on my mom's side waiting until the wee hours for his night blooming flower to open. I really don't remember what it was except that it was a vine and it had a huge bloom on it. I was about 6 years old at the time so the hugeness could very well be relative to my size at the time. I can remember their cat seeming huge too. The claws on that thing were the most memorable since I got a closeup look at them one day after loosing a staring contest with it. Well, clock or no clock they're still not flowering on "time". It doesn't look like a typical beet but that's because it's not. I counted at least 13 different sprouts. I had to cut up the beet to remove the areas that were not quite right. There were gaps in the root where the individual plants were growing together. I think something similar happened to some carrots last year. It ended up splitting apart and little sugar ants were eating the fluid that was flowing from the cracks. The same thing happens with lots of plants. Some plants like to mix with other plants even taking over the plants at times so they can live. The strangler fig is one of those who loves to wrap itself around it's victim. Similarly it too hosts critters. Not necessarily ants but other critters use the eventual hollow.